The early 19th-century East Village Meeting House, now known as the Old Brick Church, is an excellent example of a Greek Revival style masonry meeting house. 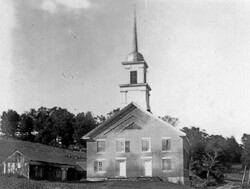 The meeting house, serving both religious and secular functions, had no precedent in England, and was an early American building type. In 18th-century New England, meeting houses were characterized by their rectangular form, gable roof, and steeple symbolizing its importance to the community. The local brick used in this meeting house's construction distinguishes it from others in the area, most of which were wooden. 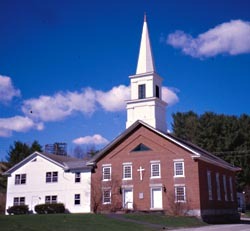 The East Village Meeting House remains the visual, religious, and social focus of the village of East Montpelier. When the Meeting House was built in 1834, the two front doors provided entrances on either side of the pulpit. In 1908, the base of the pulpit was sawn off and the top portion moved and attached to the opposite wall. At this time the original pews, which initially faced the doors and pulpit, were reversed. The choir loft, above the original pulpit location, was also closed in. The original windows were comprised of 50 small panes of clear glass, unfortunately only one of these remains. In 1908 stained glass memorial windows were installed, and only three of these remain. In 1954, three memorial windows were salvaged from a neighboring church that was demolished and installed at East Village. The excellent craftsmanship of the masonry work is evidenced in the unusual brick designs of the gable end. While building the Meeting House, some of these brick masons were also working on the Vermont State House that was built in the 1830s. The meeting house first served Methodists and Universalists. In 1858, the Methodists withdrew, while the Universalists continued to worship here. In 1864, Reverend Olympia Brown, the first female minister ordained by the Universalist Church, preached here. By 1980, the East Village church was once again a united church serving not only Universalists but Methodists, Baptists, and Congregationalists as well. The East Village Meeting House is located on Rt. 14 where that road merges with Rt. 2, just before the intersection of Quaker Hill Rd. It is open 9:00am to 3:00pm, call 802-223-3313 for further information.